The Absences page gives you a great overview of existing employee absences and allows you to edit them and create new absences. When you go to the Absences page, it will open up in calendar view, which gives you an easy to grasp instant overview of all of your people absences - absences are colour coded according to the settings you have applied on your Absence settings page. You can view details about and edit an absence by clicking on the coloured squares of an absence. There are several filters on the absences page that make going through the absences a lot easier. You can filter the view by department, staff member, site and absence. You can also view your absences in a more compact list view. To do that, click on the little list icon (within the red frame) in the top left corner of the page. In the list view you can have an even quicker overview of absences and also delete them if needed. 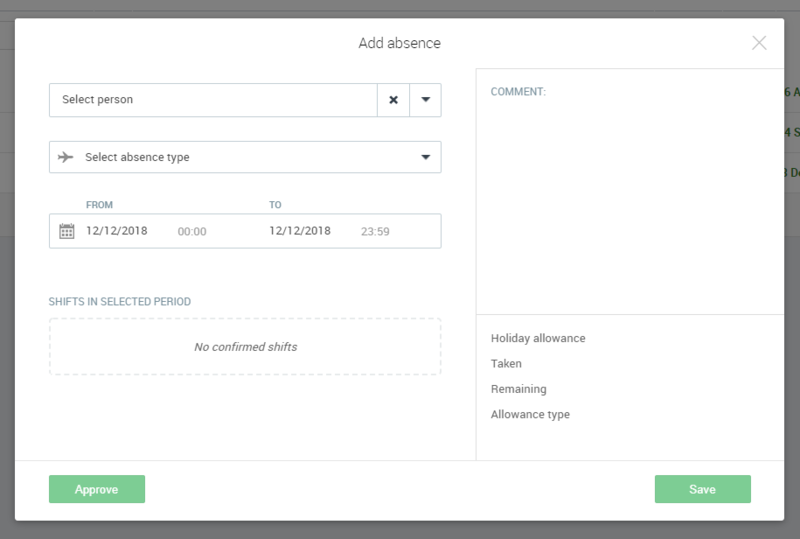 You can add a new absence by simply clicking on the green 'Add absence' button in the top right corner of the list view or absence overview pages and filling in all necessary information. Or you can directly add an absence to a person by clicking on the box dedicated to that person. You can also see every person's total absence allowance in days and how many days they have used out of it next to their name in the list. And that's pretty much all there is to know about the Absences page!